Summer is gone but that doesn’t mean you can’t travel or prepare for the upcoming season! 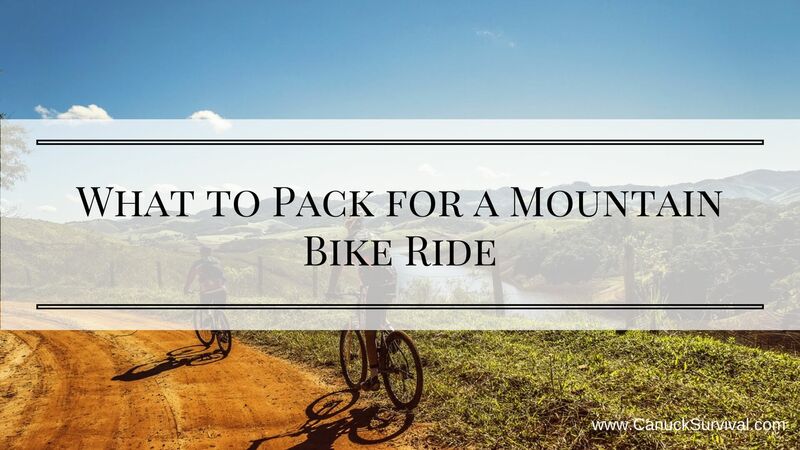 Before you head out make sure to know what to pack for a mountain bike ride. Many people ride without much other than a bottle of water, phone, and keys. That might be okay for a quick boot around town but not on a 3hr+ ride in the woods. Depending where you’ll be riding you could come across other people who will be close-by if you need help, or you’ll see absolutely no one and you’re left relying on your gear and knowledge. Like with everything in life you have to be prepared for anything. Let’s skip the obvious must-haves (bike and helmet) and jump into what to carry on your back. In my opinion a hydration pack is a must. You will get thirsty and a hydration bag allows you to drink water hands(ish)-free and without stopping. Be sure to find one that has extra storage space for the gear you’ll be taking. Popular choices in the community are the Camelbak M.U.L.E. and Osprey Raptor 10. But if you are on a budget or don’t ride much, then that sort of investment may not be for you. Check out your local MEC, Wal-Mart, Canadian Tire, and sometimes Costco for some budget friendly options. If you haven’t gone tubeless yet then spare tubes are a must. The last thing you want is a flat tire forcing you to hike-a-bike back to the trail head. A tube patch kit will come in handy for the small punctures that can easily be fixed. Keep in mind if the glue is taking too long to set it may be faster to replace the tube with your spare then patch the puncture when you get home. Don’t forget your tire levers! Bring a small hand held pump to adjust your pressure. It’s beneficial to pack an air gauge to fine adjust your pressure. I usually bring my floor pump in the car to check/adjust my pressure as needed before hitting the trail. A multi-tool specific for bikes will definitely come in handy should the occasion arise. You never know what’s going to happen during your ride. You could get yourself hurt or come across someone else who has and needs help. It’s always a good idea to carry some form of first-aid kit no matter where you go. Keep it light and compact by bringing only what you know how to use, and don’t bring too much of one thing. Chances are you won’t need 100 band-aids, bring a few and replenish your kit as you use them. The derailleur hanger is meant to bend or break in a crash by taking the strain and sacrificing itself instead of the frame. Much cheaper to replace the hanger than a frame, right? A broken chain is no good, carry a spare master link just in case you need to make a quick trail-side chain repair. Not completely necessary, but it’s always good to carry some sort of blade for any occasion. Opening packages, cutting bandages, foliage, rope/ties, etc. May come in handy for emergency repairs of just about anything. Always good to have some spare cash on hand! Snacks are a must-have for any sort of physical activity. Generally, it’s good to have a snack for every hour of riding. I typically take some Clif Bars and sometimes a pack of Honey Stinger Chews for a treat. Check out their caffeinated flavours for an extra boost of energy. And that’s it! It may seem like a lot but it’s really not once you have a proper pack like the Osprey Raptor 10. Did I miss anything or is there something you would leave behind? Let me know in the comments!